Side dish: Any boyfriend who brings fried chicken as a surprise to his girlfriend’s workplace is husband material. If he follows this well-rated recipe for fried chicken, even better. Kim Soo Jin (Song Ji Hyo) walks into Na Ji Ah’s (Jang Ji Eun) restaurant to find Ra Ra (Hwa Young) and Jang Hwa Young (Lee Yoon Ji) putting up party decorations. 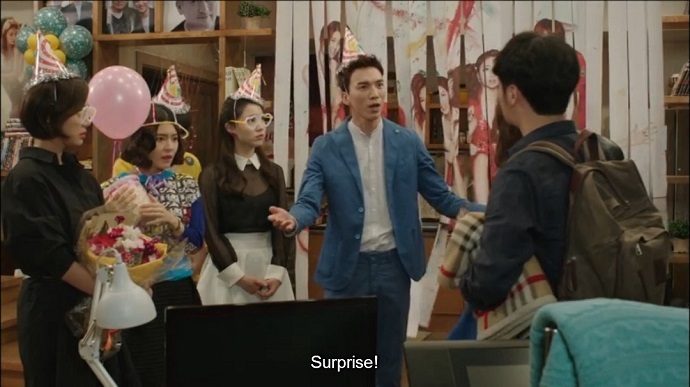 The ex-girlfriends of Bang Myeong Soo (Byun Yo Han) are throwing him a surprise party to mark the end of his successful webtoon. Ji Ah walks into the room as Soo Jin is blowing up a balloon. The balloon noisily deflates as a shocked Soo Jin recognizes the t-shirt that Ji Ah is wearing as the one Soo Jin returned to Myeong Soo. Soo Jin gives an excuse for not attending the party, then stumbles out. Myeong Soo returns from his countryside field trip to find Soo Jin waiting outside his house. Soo Jin asks why he is not at Ji Ah’s restaurant, but it appears that Myeong Soo never got the invite to his own surprise party. When Soo Jin claims to simply be returning a blanket to Myeong Soo, he stops her from leaving, and asks to speak inside. Everyone waits for Soo Jin’s answer to Myeong Soo’s proposal with bated breath. She tries to pass his words off as a joke, but Myeong Soo immediately refutes this. Still, Soo Jin insists that they are only friends as everyone looks unconvinced. The party quickly clears out of this awkward scene. Ra Ra follows Jo Geun to a coffee shop where he asks for information about Soo Jin and Myeong Soo. Ra Ra attempts to turn it into a flirty information exchange, but Jo Geun turns her down flat. Poor Ra Ra’s face falls as he tells her that he will not date her for information, and that she should value herself more. Back at the party site, Myeong Soo is accusing Soo Jin of humiliating him the same way he did to her. Soo Jin just wanted to keep any relationship they have a secret. However, she refuses to confirm whether she sees Myeong Soo as anything more than a friend. Meanwhile, Myeong Soo’s ex-girlfriends are debating how they would feel about him dating Soo Jin. Ra Ra is relieved that Soo Jin is less hot than her. Hwa Young would have preferred knowing that Myeong Soo left her for someone with better specs. Ji Ah probably reflects the opinion of the majority of women who do not want to see their ex with someone better. All three girlfriends decide to have a go at meddling in Myeong Soo’s possible relationship with Soo Jin. Hwa Young points out that Soo Jin would be better suited with the wealthy Jo Geun. Ji Ah accuses Soo Jin of two-timing with Jo Geun. Ra Ra predicts that Jo Geun will make Soo Jin his plaything, and she is genuinely worried, though more for her own prospects with Jo Geun than for Soo Jin’s emotional wellbeing. Myeong Soo attempts to surprise Soo Jin at the office with fried chicken, but ends up diving under a desk when Jo Geun suddenly arrives. Soo Jin soon realizes that Myeong Soo is present, and ends up rushing right up to Jo Geun to prevent him from discovering Myeong Soo. Jo Geun is taken aback, but quickly returns to form by bluntly questioning Soo Jin about her feelings for Myeong Soo. Soo Jin is just as vague with Jo Geun as she was with Myeong Soo. While eating the fried chicken in the park, Myeong Soo asks Soo Jin for a straight answer on how she feels about him. Soo Jin finally admits that she likes him, though she is scared of getting hurt again. She asks him to be patient with her, and Myeong Soo flashes his winning smile in response, but looks pensive when Soo Jin looks away. A persistent Myeong Soo calls up Soo Jin to propose seeing a movie tomorrow. However, Soo Jin is going to check out a film site, and though she initially plays it cool, she resorts to aegyo by the end of their phone call. After confirming that she would be alone, Myeong Soo manages to ‘accidentally’ run into Soo Jin during her site surveillance. She takes photos of possible film sites with her phone, and he uses his SLR camera to snap photos of Soo Jin on the sly. After spending a cute day together exploring the neighbourhood, they photograph their couple shoes. While struggling with Myeong Soo over deleting bad photos of herself, Soo Jin ends up with her arms around Myeong Soo’s torso. They awkwardly break apart when they realize they are engaging in skinship. At the end of the day, Myeong Soo jealously asks when he can see Soo Jin again. Soo Jin laughs and is about to leave when Myeong Soo directs her to take his camera out of its bag. As Soo Jin dips her head forward, Myeong Soo kisses her on the cheek. Soo Jin is shocked, and Myeong Soo appears just as taken aback by his own actions. Alone in her bedroom, Soo Jin does not hold back from expressing how elated she is by Myeong Soo’s kiss. She immediately accesses the memory card of Myeong Soo’s photos to relive their day together. When Soo Jin spots a video, she plays it without hesitation. It turns out to be a farewell message from Ji Ah recorded the night before her wedding. She tearfully admits that she loves Myeong Soo and will always love him. The next day, Soo Jin remains haunted by the fact that Ji Ah’s video exists, especially after Ji Ah directed Myeong Soo to erase it if he no longer loves her. Jo Geun sweeps in, demanding to see her film site photos. The shot of their couple shoes comes up, and Jo Geun reprimands Soo Jin for dating rather than working for him, every single moment. He orders her to work all night. When Myeong Soo attempts to meet up with Soo Jin for dinner, she proposes a break from work to Jo Geun. 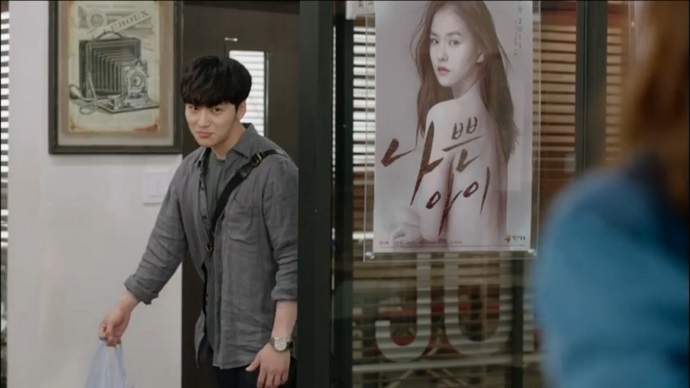 Jo Geun interprets this as an invitation to have dinner, and Soo Jin is forced to join him while Myeong Soo jumps into hiding as they pass him by. On second thought, Myeong Soo becomes hopping mad, and brazenly joins Soo Jin and Jo Geun at their dinner table. The men argue over Soo Jin, then fight over a rice cake that serves as a metaphor for Soo Jin. A puzzled Soo Jin points out that there are more than enough rice cakes for everyone. Soo Jin’s sister, Soo Kyung (Shin Dong Mi) and browbeaten brother-in-law, Ji Hoon (Cho Jung Chi) spot the love triangle after dinner. Ji Hoon is able to identify Myeong Soo, but Soo Kyung only knows her sister’s friend by reputation, and not by sight. She angrily marches over, and based on an assessment of their clothing, confuses one man for the other. Hence, Myeong Soo enjoys the fawning adoration of Soo Kyung while Jo Geun receives nothing but disdain. No one has the heart to correct Soo Kyung, and Myeong Soo is loving it. Alone on the street, Myeong Soo and Jo Geun continue fighting over Soo Jin, but it’s nothing more than a difference of opinion since Soo Jin has failed to make her relationship with Myeong Soo a known fact. Jo Geun questions whether Myeong Soo can escape the long reach of his ex-girlfriends. Meanwhile, the ex-girlfriends are also on the mind of Soo Jin and Ji Hoon. Her brother-in-law correctly guesses that Ji Ah is the one Myeong Soo loved the most. Soo Jin decides to propose dinner at Ji Ah’s restaurant to Myeong Soo. Since he has been avoiding the restaurant, Myeong Soo is perplexed by her request. When he mentions this to Ra Ra, she advises him to publicly declare that he is dating Soo Jin to all the ex-girlfriends. She insists that that is Soo Jin’s ulterior motive for dining at the ex-girlfriends’ unofficial clubhouse. When Soo Jin and Myeong Soo arrive at Ji Ah’s restaurant, she hesitates in entering, but he presses forward with the intention of following Ra Ra’s advice. However, only a distracted Ji Ah is present, and Myeong Soo is forced to throw himself between her and a grease fire. At the hospital, the status of Myeong Soo and Ji Ah is unclear. Soo Jin sits in the waiting room, thinking of Myeong Soo’s kiss, but also replaying the scene of Myeong Soo saving Ji Ah without any regard for himself. For her, all evidence points to a considerable rival for Myeong Soo’s affections. Having followed Soo Jin through the humiliation phase of the show, her reluctance to commit to a relationship with Myeong Soo is understandable. Still, I found it annoying to watch Myeong Soo lay out his feelings, ask Soo Jin to confirm how she feels, then romance her while in a state of uncertainty. Learning from past mistakes, Myeong Soo is now actively pursuing Soo Jin, but it does not appear that Soo Jin has made any progress when she continues to hold Myeong Soo at arm’s length. Soo Jin’s uncertainty is also the reason why Myeong Soo and Jo Geun continue to fight. Sure, it’s entertaining to watch, but it reflects badly on the female lead, since her wavering is the source of unnecessary strife. Her lack of trust in Myeong Soo’s feelings for her fueled her morbid curiosity about Myeong Soo’s feelings for Ji Ah, and helped bring about the disaster at the end of the episode. Contrast this with Jo Geun’s blunt rejection of Ra Ra, and while his approach may appear cruel, it is actually the better way since Ra Ra now knows exactly where she stands, and she is forced to assess the way she operates in general. However, there are a few certainties to come out of this episode: Ji Ah should not run a restaurant, Ra Ra should have her own variety show, and Myeong Soo is a heartthrob. That last point is thanks to Byun Yo Han who elevated a simple kiss on the cheek by making the internal war between desire and restraint so apparent. Here is some smouldering for your viewing pleasure. I totally agree with your points, esp re: Soo Jin. I understand her reluctance but when a guy is basically creating every opportunity to be with you, u shud jump on it by all means. And when that guy is Myeong Soo, u shouldn’t have to think twice. 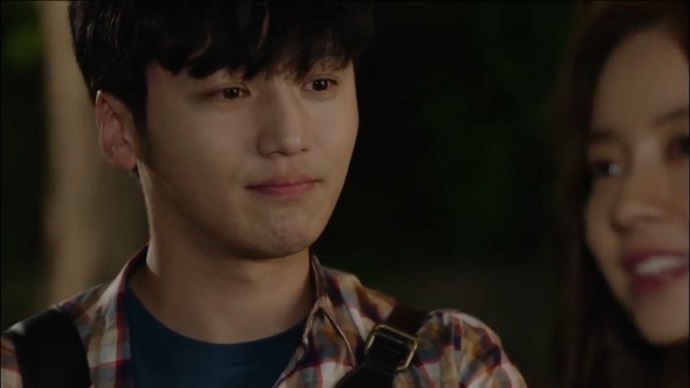 And yes, isn’t Myeong Soo looking more and more swoon-worthy each ep, haha. All that aside, SJ does need to get her feelings and reservations out there, tho. If they can get passed all those girl-meddlers, then they should be fine. These past two eps made me dislike Hwa-Young and Ji Ah tho. They’re too much. I think SJ was right to then keep the relationship under wraps. But then the question is why bother, since they seem to find out everything anyway? I agree about what you said on disliking HY and JA. Why such “hasad” (its arabic, but there isn’t any other word that fits this…envy, but worse than that…envy just b/c you don’t want another person to have it)? It’s actually quite a common trait in kdramas, one that no matter how many times I see it, it makes me sick in my stomach. Ji Ah, the more episodes there are…the more dislike I feel about her. She’s such a two face, it isn’t even funny. I’m glad the director said it to her face, that she has no right to say to SJ that she throws people to the side after they’re done with them. I mean, she accused SJ to be a fox, yet we know from the video, she kept on seeing MS until the day BEFORE she gets married. Who does that?? MS is seriously too nice. I would’ve associated her name with a curse word if that happened to me. I can understand SJ’s reluctance, though…yes, MS laid himself before her. Yet at the same time, he never completely lets go of his noona. I would also question myself on trusting a guy with my heart, if that’s the case. Especially since she’s completely misunderstood their relationship before. As much as it seems that she’s stringing him along, for me I can see him stringing her along also. The guy is nice, yes. He’s a bit too nice to everyone, though. It’s fine to have a bff like him, but putting your heart out there for him? Hmm, I’d hold back like SJ too, honestly. Hasad-I know the word too,more like jealousy and envy like you said. Anyway, I echo your opinion too. I think it’s good that MyeongSoo laid his feelings out in the open to SooJin coz she should know and be confident about it and not being stump by a dismissal 3 years after a sudden broke up with a person she loved. There’s more to MyeongSoo and SooJin story which made SooJin extra cautious but what we can be rest assured is that she loved him then, and she continues to feel that way with him so all hope isn’t lost. MyeongSoo just need to makes it clear that it’s her and not Na JiAh. Anyway, sorry to be riding on this comment. This drama has been ruling my days and I just can’t get enough. Ohmygawd, Myung Soo is such a heartthrob!!!! I too melted at that cheek-kiss.. Thanks for the recap. Can’t wait till next week! I’m sure Myeong Soo’s first love is Soo jin, which he loved (keeps on loving) the most. I disagree in saying that MS’s first love is SJ. I thought this was pretty clear that his first love is JA. Now, on the person he loves the most…he didn’t say. I completely sympathize with Soo Jin. Is she keeping him at arm’s length? Yes? Should she just jump as this chance with Myeong Soo because of his confession and his swoonworthy smile? No. We are seeing everything; she is not. She does not know how he gave up the movie for her. She does not know how he accidentally left the shirt at the restaurant. She did not see how furious he was at the girlfriends–to the point that he actually scared them–over the trick because she had already left in the cab. She only has what she sees and her memory of thinking they were in a relationship only to find out after suffering heart ache that he never thought they were dating in the first place. The grand love of “her” life didn’t even make it into his webtoon! She also has a job. And I am sorry but people have to work for a living. She was a second away from being jobless, and now she has a chance to get the business back on track and perhaps even hire back all the people she had to let go in the first place, and now because Myeong Soo has time (because he is not working) to pursue her, she is supposed to drop everything and go out with him? Sigh. I want them together, too, but he knows what her work is like and producers have to be at everyone’s beck and call during a production, so he needs to understand. He got a confession from her and also that she is still scared, and with everything that has happened and what he has told her about his relationship with Ji Ah, who wouldn’t be intimidated by that? it’s really sad that it’s official now that this drama got reduced to 12 episodes from 16 episodes.